The specialist cycling in different media, radio, tv and press. Bulls look very good if not directly feel the danger in your flesh. Not, I will not talk about bulls, mine is cycling and I learned to ride a bike without training wheels to 3 years old, compete to 11 and I started professionally for 14 seasons. A mis 53 I still do between studs 10.000 and 15.000 km per year with enough quality. Because you do not want the thing I've been 50 years riding a bike, eso si, I've never felt compelled to do, I still like, While it is true, professional level there is the same romanticism that have lower grades and cycling or. So when talking about professional cycling, or other sports professionals, is very important to listen to the experts who really are those who know the reality of their profession. This comes about because entradrilla director Cycling Fund, Miguel Angel Boy, suggested to me to tell my experience in the media, the differences between the journal, radio or the tele. 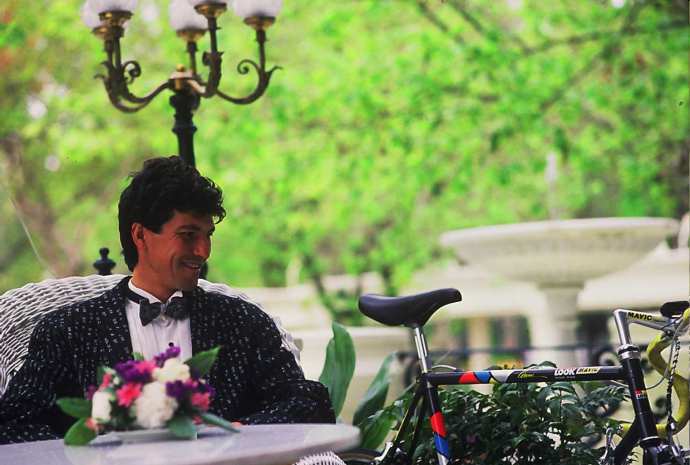 You know that since I stopped competing, back in 1993, I have dedicated cycling comment was first with EFE Radio 1994, I enjoyed agree booths Meta one of the great: Luis Ocaña, con mi musa, with the rider that inspired me to try to follow in his footsteps, Luis commented on the COPE with José María García. During that first Tour of Spain from the sidelines, we met every day and I got to know him a bit more as a person, as I thought about. A few days after finishing the Vuelta I froze and pricked with the tragic news of his suicide, it was a very big stick that saddened me a lot and made me reflect on what would have been the reasons which have led to a major, a wrestler to have the courage to kill himself with one stone. 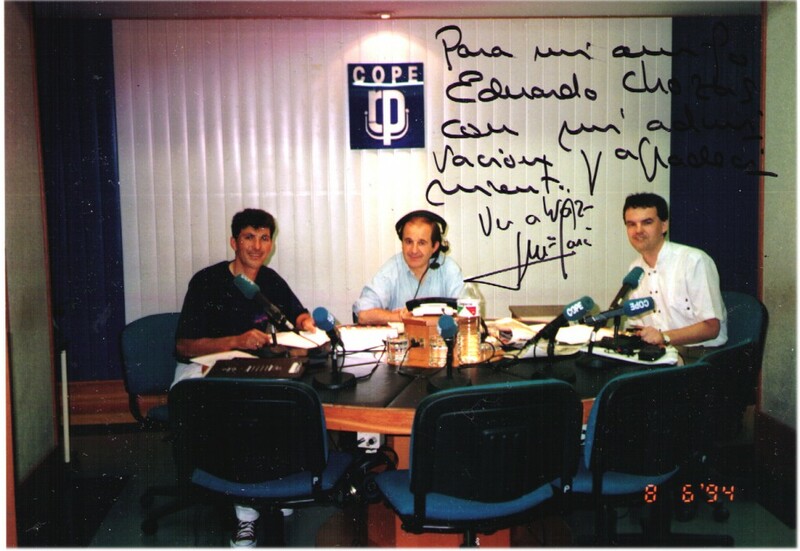 A few days later I received a call directly from José María García to wonder what if I wanted to comment on your Swing 1994, since, until he left the COPE, at 2000, and led me to ONDA CERO, I was with him and his commentary team up 2004, learned mucho great journalists like Agustín Castellote, a phenomenon of narrative as Ángel González Ucelay that put you goosebumps with his tone and his words full improvised wit and epic, I really slang phrase of his that actually said on the air: "I like, a lot of cycling, I do not understand anything, "suggesting that we mean by having practiced and know how to communicate are very necessary. In Onda Cero finished my journey on the radio and I was with the master teacher and inspirer of any storyteller worth his salt: Javier Ares, also a great lover and connoisseur of cycling. As you can see I have been privileged because I can say that apart from sharing many hours with real live teachers, and create great friendships, I learned a lot from them and what matters to the fans who count a sport. In this sense it is where a specialist, to communicate well, is essential to give a real situation that happens Race, we are a manual explanation within continuous information in the strictest direct. On the radio I passed the international TV channel Eurosport commented Antonio Alix all cycling events that many: Classic, Paris Nice, Tour, Dauphiné, Tour, Olympiad, Vuelta and World Championships, TV is another world, though the system is similar to the radio, we have many hours for each test and you can expound with comments, addition to pure information can explain much better why things happen, discuss technical, training, materials, create debates, interact with Twitter followers, anecdotes and experiences. In principle there is no difference between commenting on the radio or on television, than from the test or from a studio because you see the same image. If that is different from inside and did two years in the motorcycle squad, Live from entering the race, many times in decreases in ports where the image on TV is not good and the situation you describe in your own words or, also ask the directors to go live from the same window of their cars. I must say that I have spent more afraid motorcycle package in my 14 participations in the Tour as a cyclist, on the bike you control the situation you. The fact is that radio is more dynamic than the pace of television storytelling, with live calls from many people who have shone in cycling and enrich the program. The radio works harder, to that effect in attracting the seeing the images on the screen of a TV, while TV has input and the value of the emission images and comply with this though should improve, could get the system to apply radio broadcasts. Finally, summing a bit, the provision of a specialist is to decipher a race situation you are viewing like you're right there, pedagogically explicarlo: say what happens, by what happens, tactics and analyze other possible alternatives that could happen, analyze well the paths, dangerous circumstances and other areas that are in a competition you must decipher and put it together with you are listening. On the other side is the magazine Cycling Fund I write monthly answering some reader questions and playing an interesting topic as a chronic, This kind of journalism is more reflective, slower, to look for and select what can be more interesting to the reader already knows cycling news.